Forget gold, frankincense and myrrh: we’ve constructed the ultimate three-gift tower to chocolate heaven. 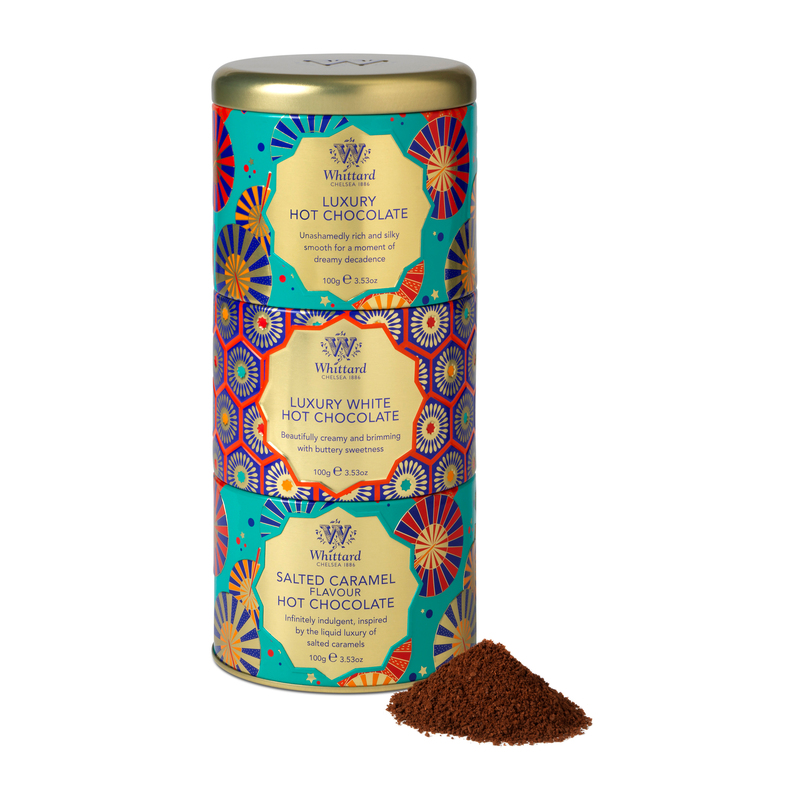 For a luxurious base, our Salted Caramel Flavour Hot Chocolate is a decadent Christmas evening treat. In the middle is our Luxury White Hot Chocolate: buttery, creamy and smooth as silk. And crowning it all, our Luxury Hot Chocolate is an all-time classic, perfecting the simple pleasure of a cup of cocoa. Luxury Hot Chocolate: Sugar, Cocoa (39%), Dextrose, Salt, Flavouring. Contains Cocoa solids 39% minimum. Luxury White Hot Chocolate: Sugar, Cocoa Butter (15%), Skimmed Milk Powder, Dextrose, Whey Powder (Milk), Salt, Flavouring, Emulsifier: E450 (Diphosphates). Salted Caramel Flavour Hot Chocolate: Sugar, Cocoa (36%), Dextrose, Flavouring, Salt. Contains Cocoa solids 36% minimum. 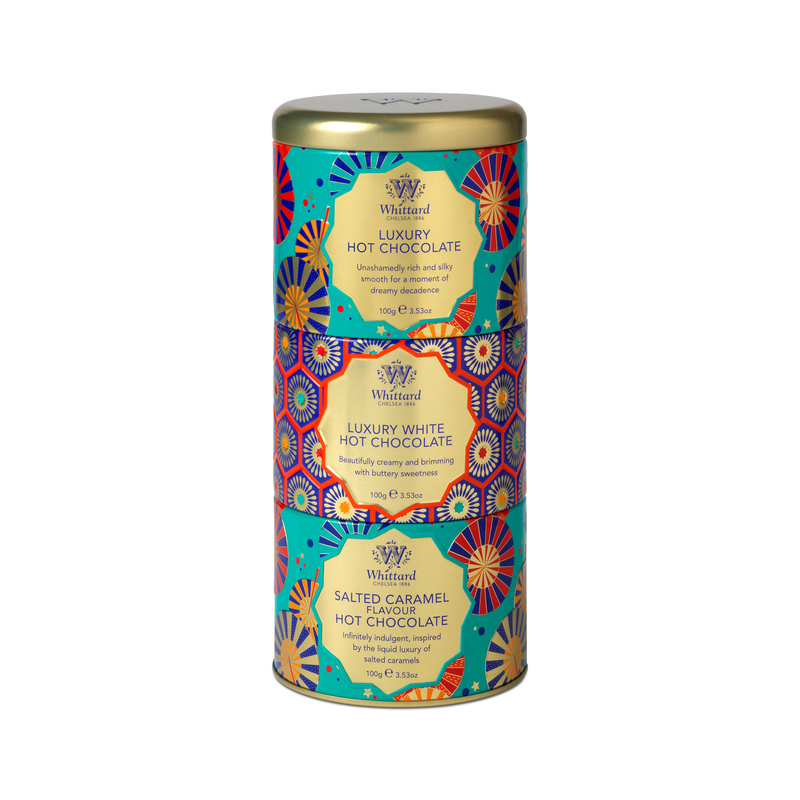 Gorgeous packaged hot chocolate with three of the best flavoured (except for sticky toffee pud as that was amazing!!) hot chocolates. I ❤️ This!